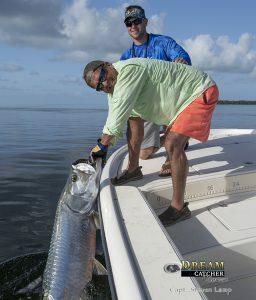 Home » Fishing Reports » Tarpon In August – Yes! August 2nd 2o18 – Tropical weather has been here in Key West for weeks. We have seen water temps as high as 90 this year in the backcountry and on the flats. Not super hot as years in the past but generally a game changer for tarpon season. Not the case this year with water temps now back into the mid and low 80s. Angler releases his bucket list Tarpon in Key West fishing with me last week. Mostly baby (juvenile) tarpon are around these days. Typical for this time of the year to beat the trees in and around the mangrove islands looking for a smaller tarpon to pick on with a fly rod or light tackle spinning rod. This year we are still holding on to some monsters in some places that we have been finding. Big tarpon are still a thing as of when I write this. Not an easy find but we are getting into them. I was tarpon fishing a spot out West of Key West a few days ago with an angler that had a bucket list wish to fill and we jumped a beast. When that fish breached it went straight up and was as tall as I am with its tail still in the water. Im guessing it was about 7ft long. I just stood there dumfounded as the tarpon ungracefully fell back into the water with a hard hitting splash. We were fishing artificial baits that day and jumped about 3 more large fish to make a fun half day tarpon fishing trip out of it. Booking a tarpon trip with us in August is not a guaranteed shot. Of course tarpon fishing as a whole, never is. We have a good bit of other things going on as well. Check out my flats fishing report to see what else you can add to a fun day of tarpon fishing here with us at Dream Catcher Charters — Fishing in Key West.